Astrology is an ancient art and science, a study of the celestial movements of planets and stars. Through the ages it has been both lauded and defiled for its oracle usage. Yet, its original intention offers valuable guidance for understanding and navigating life's cycles. From this art of celestial gazing and observing, a variety of perspectives and knowledge has evolved, spanning various cultures and societies around the world. 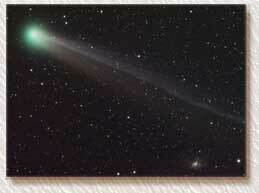 Each Astrological system has a specific method of interpreting the movements of the heavens. Western, Vedic, Chinese, Aboriginal, and Arabic are valid and unique to their own culture. I developed a holistic system from Western astrology I call Quantum Dynamic Astrology. This system is based on archetypes and symbolic reference to the "as above, so below" mystery. 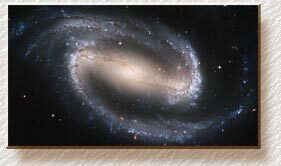 It honors the sacred passages of our solar system as we spiral through the Milky Way Galaxy. Astrologer Daniel Giamario's Shamanic Astrology was a strong influence on my early astrological path in 1995 and the development of my approach and understanding of astrology. Quantum Dynamic Astrology embraces our species sentient evolution of consciousness. I support this growth by pro-actively working with an individual's astrological chart in workshops, consultations and bodywork. I synergistically combine the oracles of Astrology and Voyager Tarot. This dynamic combination adds further context to "what's up" in your personal growth process. Quantum Dynamic Astrology views the cycles and rhythms of life through metaphor and symbology. Each symbol or archetype represents a form of energy with unique traits and characteristics. Rather than predictive, this astrological exploration delves into the depths of the generational and cultural and genetic rhythms that mold and shape our civilization. New awareness, greater sensitivity and a more holistic approach to life "evolve" from understanding the power of the planetary patterns in your birth chart. Let's look at the foundation of Quantum Dynamic Astrology. "We are stardust". Each cell of our body has evolved from earthly elements. These elements originated in the heart of a dying star eons ago. Our cells retain this celestial memory and connection. "As above, so below; as within, so with out" says the Hermetic principle. Gravitational and electromagnetic forces beyond our brain's comprehension shape and mold the galaxies and our bodies. This moment to moment tidal effect on the body-mind ultimately reveals itself in each person's "external reality". A continuous loop of awareness and experiences results. As our awareness expands, we become more attuned to the Cosmos and the Cosmos becomes more aware of us. How does this connection to the Cosmos affect your life? Our perception of the night sky is influenced and constrained by time and space. Even though light travels at a mind boggling speed (186,000 miles or 310,000 kilometers per second), the vastness of the Universe make this speed seem rather slow. For example, the light of our Sun travels over 93 million miles covering this vast stretch in about is 8 minutes (or 8 light minutes). Hence, we see the Sun as it existed 8 minutes ago. The Moon is 1 1/2 "light-seconds" away. This "distance-factor" becomes even more extreme as we move farther out in space to other planets, stars and galaxies. Hence, our perception of the Universe is "as it was" rather than "as it is NOW." In truth, the only place where we can experience the NOW Universal moment is within our being. The astrological cycles mirror this inner process. Certainly, a paradox is at play here. "The way out is in". As I gaze out at the sky I realize I see a mirror image of my "inner Universe". The true journey of expanding awareness is inside as the mystics have said all along. The Zodiac (the 12 signs behind the apparent movement of the solar system members), the Sun and Planets remind me of movement or rhythms and tides occurring in my internal body/mind systems. Astrology, in its various forms has created an interpretation of these movements based on empirical evidence, i.e. peoples specific experiences on an individual, generational, and cultural level. This evolving compendium of information offers an understanding of "what's up now" and strategies for consciously working with these cycles in our Cosmic playground. At the moment of birth, the external celestial sphere imprints a unique template of information or celestial memory on the human psyche and DNA. This energy form contains the planetary positions of our solar system members relative to each other and to the 12 Zodiac signs. I consider the "natal chart" to be a reflection of the "as above, so below" mysteries, a look at your inner Universe. In the Western Astrological Model, the natal chart is a 360 degree circle divided into 12 segments or houses - one specific to each sign of the Zodiac. The various planets create a sacred mandala based on their celestial positions at the moment of your birth. Each house is ruled by a particular sign, starting with Aries, the "first" sign of the Zodiac. Hence, the 1st house is ruled by Aries, 2nd by Taurus etc. to the 12th house ruled by the sign of Pisces. Each house has a specific theme relative to its ruling zodiac sign. Developing an understanding for each planet and zodiacal sign is very helpful for understanding the richness and power of your chart. 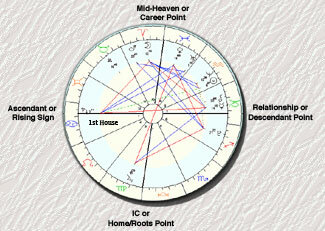 Have a look here for further definition of the major planetary influences in a natal chart. The starting point (9 o'clock position) or the "eastern position" of the chart is referred to as the Ascendant or Rising Sign. 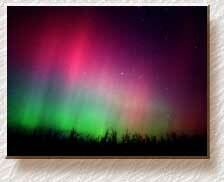 Mystics view the eastern sky as a gateway or portal toward which you are moving. Consider your rising sign placement as a doorway for your life intention. As the Earth rotates daily on its axis, the Zodiac signs "rise" in the east, just as the Sun and Moon rise each day. Since the Earth's rotation takes 24 hours, and there exist 12 Zodiac signs, it follows each sign resides in the rising position for approximately 2 hours each day (24 / 2). Further definition of the Rising Sign or Ascendant is derived from the house placement of the North Node. The north node is where the Moon's orbital plane intersects the Earth's orbit. The North Nodal position is considered a developmental point in your chart, just like your rising sign. The house position of the North Node offers further definition to your rising sign. This theme can be any one of the 12 zodiac signs. There exist 144 combinations (12 rising signs x 12 house themes). There are three other significant points on the chart wheel. The bottom or the 6 o'clock position is referred to as the IC or the home and roots position. The 3 o'clock point is the descendant or relationship point. The 12 o'clock position is the Mid-Heaven or Career point. The Planets, Sun, Moon and their angular relationships create a life script. This includes the type of experiences which best serve you; what you are here to develop this life time and potential challenges inherent to your evolutionary growth on all seen and unseen levels of consciousness. The Universe is in a constant state of change. Its cycles define our evolution as a species and your growth as a spiritual/energetic Being. "Awareness" is power. It is also an optional choice - how much do you want to become aware? How much do you wish to consciously participate with life's ebb and flows? Remember, change is inevitable, growth is optional. We are all affected by these celestial tides regardless of your station in life. Through a deeper understanding of your Natal Chart, working consciously with its rhythms and cycles, your level of understanding and awareness expands, adding more options to your life direction and choices.